It is a quarterly journal that focuses on identifying Financial risk in Capital/Debt/Forex markets and their management models; Derivatives as Price Discovery Tools and Hedging devices; Hedging techniques; Asset-liability management; Organizational culture, Risk-bearing capacity and Leadership role in management of risk. 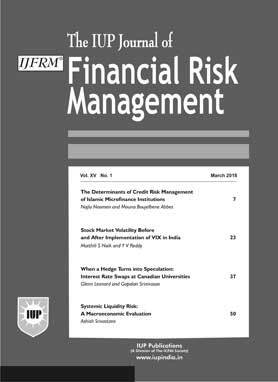 The journal provides a platform for cutting-edge research in the field of financial risk management. The present study is an attempt to empirically examine the impact of Basel Accord regulatory guidelines on the capital and risk behavior of Indian banks. It aims to assess how Indian banks adjust capital and risk under capital regulation. The study uses simultaneous equation modeling with Three-Stage Least Square (3SLS) regression to study the endogenous relationship between risk and capital. A regulatory dummy variable has been included as a proxy for Basel norms regulation. The data of public and private sector banks operating in India over a period from 2006 to 2016 is used for the present study. The results evidently reveal significant impact of Basel norms on the capital and risk behavior of Indian banks. The study found a positive impact of Basel norms on the capital level of Indian banks. The results also highlight the negative relationship between capital and risk in the context of Indian banks. Future contracts in commodity market with limited maturities are used primarily to hedge risk in underlying commodity price and/or to enlarge potential to make profit taking advantage of price movements of the underlying instead of buying or selling of the commodity in the cash market. Based on daily price movements on the NCDEX from April 2012 through March 2017, this paper is an endeavor to scrutinize the efficiency of commodity market in India and unpredictable spillover effects in the spot and futures market with regard to agri commodities-guar seed, chana, soy oil and mustard seed. The results of the study are based on Augmented Dickey-Fuller (ADF) test, Johansen cointegration test, Vector Error Correction Model (VECM), and GARCH and EGARCH methodology. The results of the study indicate that long-term equilibrium relationship exists between the spot and the futures price of sample commodities. The result also indicates that the commodity futures market effectively serves the price discovery platform for the underlying spot market thus validating spillover of information from futures to spot markets. The results reported also point to the volatility transmission across the markets per se, however, it is the inverse transmission (from the futures market to the spot market) that was noticed to be more rigorous and robust. The findings reported have wider implications for the policy makers to address stress in the farm sector, facilitating farmers' participation in the agri commodities market to supplement income, as well for seasoned market participants in strategizing trade in agri commodities. The futures contract plays an important role in price discovery and risk management. The contracts prices have an impact on spot prices and are also used for risk management by hedging. This paper reviews the casual relationship between black pepper spot and futures prices through regression and Granger causality technique. This study finds a unidirectional relationship between pepper futures prices and spot prices.